The text of the Medical lecture published below was distributed by Dr. Med. 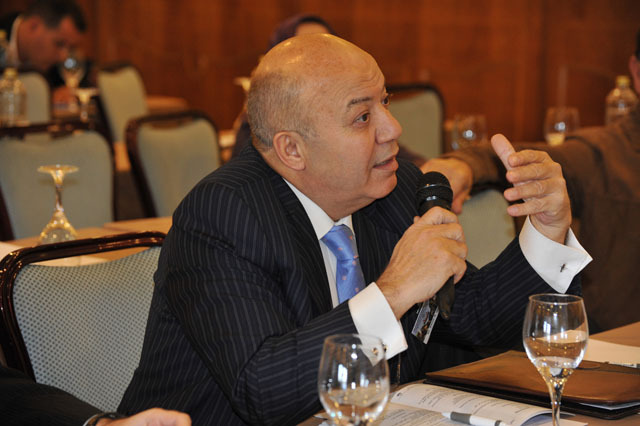 Samir Asaad Quasami on 28 October 2011 during the opening session of the Conference 27th Annual Meeting of ARABMED in Madrid. Dr. Qawasmi is originally a Palestinian doctor who was born in the city of Ramla. The roots of his family, since long before the Palestinian catastrophe (Nakba), are from Hebron and Jerusalem. He currently lives living in Jordan. Dr. Qawasmi remembers well what his parents told him about the Nakba of 1948, of how the terrorists from the zionist agency looted three houses and a number of shops owned by his family in the context of the ethnic cleansing campaign against Palestinians which affected dozens of Palestinian cities and towns on which later the zionists established their so-called Israel on the ruins of Palestinian property and homeland. Dr. Qawasmi nowadays is one of the most famous Cornea specialists, not in the Kingdom of Jordan but worldwide. (Click on the picture to see it bigger). The lecture is the only and first time in the world which that this new discovery in the field of Paired arcuate and circular keratotomy has been presented to a wider public, it is titled: ”Paired arcuate and circular keratotomy: Alternative intervention technique for Stage III and IV keratoconus”. The content of the lecture simply talks about the outcomes of “paired arcuate keratotomy” coupled with a modified form of circular keratotomy in a single surgical procedure in eyes with stage III and IV keratoconus to reduce astigmatism, increase corneal volume, and improve visual acuity. The paired arcuate affects 2 out of every thousand citizens, and this number is expected to increase in the future. In this context, the use of lasers for the treatment of short and long sight is in consideration. The lecture is now published for the first time after the end of the ARABMED conference in Madrid, where I had opportunity to talk with the doctor Qawasmi and where he provided me with a copy of his lecture. This manuscript has not been published elsewhere and has not been submitted simultaneously for publication elsewhere. Title: Paired arcuate and circular keratotomy: Alternative intervention technique for Stage III and IV keratoconus. (Click Here to read in Arabic). Purpose/Aim of the study: To report the outcomes of paired arcuate keratotomy coupled with a modified form of circular keratotomy in a single surgical procedure in eyes with stage III and IV keratoconus to reduce astigmatism, increase corneal volume, and improve visual acuity. Materials and Methods: A retrospective, single-surgeon, single-center, clinic-based study of a surgical procedure on twenty-four eyes of fourteen patients diagnosed with Stage III or Stage IV keratoconus. Paired arcuate keratotomy coupled with modified circular keratotomy was performed at a single center by a single surgeon as an outpatient procedure with local anaesthetic in a minor surgery room. Modified circular keratotomy was performed 7 mm from the pupillary center with depth of incision ranging between 70% and 90% of corneal thickness. Arcuate keratotomy was performed 2.5 mm from the pupillary center with the depth of incision at 90% of corneal thickness. Angular length of the arcs ranged between 60° and 120° depending on the astigmatic power of the cornea. Results: Astigmatism decreased in 87.5% of the 24 treated eyes, increased in 8.33% and did not change in 4.17%. Corneal volume increased in 91.66% of the 24 eyes and decreased in 8.34%. Visual acuity improved in 100% of the eyes; there was a mean improvement of 59% from preoperative visual acuity, 8.34% of the treated eyes reaching a visual acuity of 1.0 (20/20) with assistance. No complications occurred during or after surgery. No suturing was performed and there was no rupturing at incision sites. Conclusion: Paired arcuate keratotomy coupled with modified circular keratotomy should be considered as an intervention before performing keratoplasty. Keywords: arcuate keratotomy, circular keratotomy, keratoconus, astigmatism, keratotomy, Bader Procedure. This study did not receive any funding from or contribution from the National Institutes of Health (NIH); Wellcome Trust; Howard Hughes Medical Institute (HHMI); and/or other(s). A study was made of the outcome of paired arcuate keratotomy coupled with a modified form of circular keratotomy in a single surgical procedure in eyes with Stage III and IV keratoconus with the aims of reducing astigmatism, increasing corneal volume, and improving visual acuity. Paired arcuate keratotomy coupled with modified circular keratotomy was performed on 24 eyes of 14 patients diagnosed with Stage III or Stage IV keratoconus at a single center by a single surgeon as an outpatient procedure with local anesthetic in a minor surgery room. Modified circular keratotomy was performed 7 mm from the pupillary center using incisions ranging in depth between 70% and 90% of corneal thickness. Arcuate keratotomy was performed 2.5 mm from the pupillary center with the depth of incision at 90% of corneal thickness. Angular length of the arcs ranged between 60° and 120° depending on the astigmatic power of the cornea. Astigmatism decreased in 87.5% of the 24 eyes, increased in 8.33%, and did not change in 4.17%. Corneal volume increased in 91.66% of the 24 eyes and decreased in 8.34%. Visual acuity improved in 100% of the eyes; there was a mean improvement of 59% from preoperative visual acuity, 8.34% of the treated eyes reaching a visual acuity of 1.0 (20/20) with assistance. No complications occurred during or after surgery. No suturing was performed and there was no rupturing at incision sites. Paired arcuate keratotomy coupled with modified circular keratotomy should be considered as an additional treatment procedure before performing keratoplasty. 1998, eyeglasses or contact lenses can be used to correct vision (Colin & Velou, 2003). As the disorder progresses to Stage III or IV, eyeglasses or the various kinds of contact lenses may no longer correct the disorder sufficiently (Colin & Velou, 2003). If keratoconus is not corrected, keratoplasty may be required (Colin & Velou, 2003). (Duffy et al., 1988). Subsequently, the use of an arcuate keratome to make transverse arcuate corneal incisions was examined as a method of correcting astigmatism, and successful use of the instrument in five consecutive eyes with naturally occurring astigmatism was reported (Hanna et al., 1993). Wilkins et al. (2005) used standard arcuate keratotomy in postkeratoplasty eyes, regardless of preoperative astigmatism, and concluded that standard treatment, irrespective of preoperative cylinder, has a linear effect on the reduction of postkeratoplasty astigmatism. Patients with higher degrees of preoperative astigmatism experienced greater reductions in astigmatism following the treatment. Hoffart et al. (2007) concluded that arcuate keratotomy performed with the Hanna arcitome was effective in reducing postkeratoplasty astigmatism. The device enabled safer, easier arcuate incisions compared with manual incision techniques. However, it was also concluded that predictability and efficacy could be improved by a more accurate nomogram. Circular keratotomy has been performed using a trephine blade and suturing (Wu et al., 2006), some procedures being coupled with the implantation of rings (Krumeich & Duncker, 2006). In a study of three patients, Leccisotti (2006) concluded that circular keratotomy increased corneal curvature and worsened keratoconus and could therefore not be recommended. However, Krumeich & Kezirian (2009) reported that circular keratotomy provided significant reduction in astigmatism, improved best spectacle-correctedvisual acuity, and stabilized astigmatic changes in most eyes, although some eyes showed limited benefit. Eyes with greater preoperative astigmatism appear to be more likely to benefit from the procedure than those with lower preoperative astigmatism. Circular keratotomy also resulted in reasonable clinical results in the treatment of Stage I and II keratoconus (Krumeich & Kezirian, 2009). All patients in the study came to me after examination by other doctors who had diagnosed them with Stage III or Stage IV keratoconus. 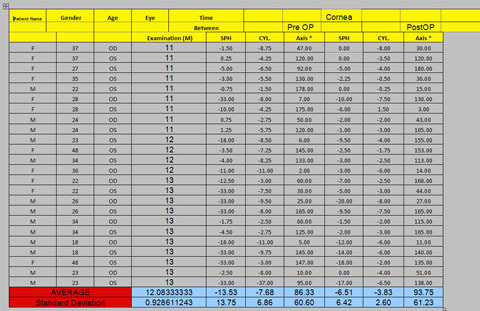 Diagnosis was confirmed by me on their first visit and classified using the Kurmeich classification (Table 1). All patients had been informed by other doctors that they required keratoplasty to treat their condition. Preoperative tracking for disease progression was not applicable in this situation because the patient had already progressed to a stage requiring treatment. All operations occurred within 1 week of their visit to me. The clinical examination at our center included the E-test, refractometer, retinoscopy, direct and indirect ophthalmoscopy, sagittal cornea examination, subjective and objective visual acuity tests, ultrasound examination, glare test and Oculus Pentacam topography and numerology. Preoperative and postoperative sphere and cylinder measurements were recorded (Table 2), but were not analyzed as dependent variables (see Discussion). 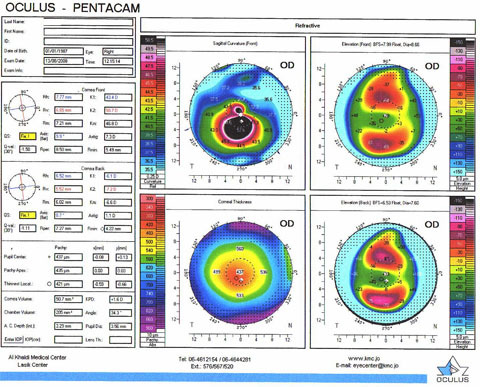 The primary outcome variables measured were uncorrected and spectacle-corrected acuity, refractive error with the pupil dilated and undilated, corneal shape, corneal pachometry, and corneal indices measured by Oculus Pentacam topography (Table 3). This approach to treatment addresses the irregularity of the cornea and the steepness of the meridian by positioning the circular keratotomy 7 mm from the pupillary center and two arcuate keratotomy incisions 2.5 mm from the pupillary center at 90° to the steepest meridian. Figure 1 represents the angular circumference of the cornea. Figure 2 illustrates one possible calculation and location for the paired arcuate incisions. Figure 3 illustrates the combination of the arcuate keratotomy and modified form of circular keratotomy. Notice that the paired arcuate incisions are of the same angular length. A Hanna arcitome with micrometric diamond knives was used. The procedure was a modified form of circular keratotomy which used microincision but no trephining. The depth, length, and location of the incisions were predetermined according to topographic readings. Two micrometric diamond knives, each with a width of 1.0 mm and thickness of 0.150 mm, were mounted 180° apart. Local anesthetic was applied and corneal thickness was measured by ultrasonic pachometry at 1,640 m/s. Three measurements were taken in the area where incisions were proposed, and the mean thickness was calculated. The blades were then set to the correct depth. Great care was taken to avoid exposure of the cornea to direct illumination as this affects its thickness during the operation (Duffrey et al., 2008). The diameter of the free cornea zone was marked and the angular length of the cut was set. Dextran solution and antibiotic were applied to moisten the surface of the cornea before, during, and after the incisions. The instrument was then placed on the eye and the blades were inserted in the cornea. The arcuate incisions were placed at a radial distance of 2.5 mm from the pupillary center on each side of the steepest axis, creating an arcuate incision diameter of 5.0 mm, and were made in one continuous sweep. The arcuate incisions were of a defined angular length extending from 60° to 120° and were determined by the degree of astigmatism. Angular length was calculated using the values of the diopteric power of the cornea, and the difference between K1 and K2 readings obtained in the Pentacam analysis of the cornea. Angular length is directly related to astigmatic corneal power (Table 4). The seating depth of the blade was adjusted with a calibrated screw mechanism at the top of each knife. The depth of the arcuate incisions ranged between 70% and 90% depending on the thickness of the cornea and corneal power. An area of low corneal power received a deeper incision than an area of high corneal power because corneal volume tends to increase more in the area of the deepest incision and less in the area of shallow incision; this allows the cornea to reform or restructure to nearly equalized corneal power. Factors that affect the actual depth of the incision in the cornea are the pachometric readings and location of the corneal thickness. Following the arcuate incisions, the modified form of circular keratotomy was performed. A full circular incision of 360°, with no corneal suction, was made in one continuous movement at 30°/s. The depth of the circular incision ranged between 70% and 90% depending on the thickness of the cornea and corneal power. For example, if corneal power was low from 20° to 200°, this area would receive an incision of depth 90% and the remaining part would receive an incision of depth 70%. If corneal power was low from 60° to 130° this area would receive an incision of depth 90% and the remaining part an incision of depth 70%. 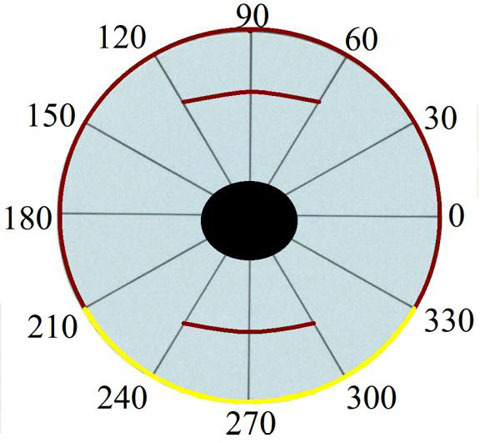 In Figure 4, the yellow arc marks the area of low corneal power from 210° to 330° and indicates an area of 90% incision depth, while the incision in the red area would be at a depth of 70%. At the conclusion of the procedure, antibiotic drops were applied and the eye(s) were covered with shields with no padding. Immediate after-care undertaken by the patient included collagen capsules (400 mg) every night before bed coupled with vitamin C (5,000 mcg), because vitamin C assists in the pump action of potassium to create pressure equilibrium, reducing haze and facilitating the synthesis of collagen (Ringsdorf Jr & Cheraskin, 1982). G-pilocarpine (2%) drops, which provide the benefit of a parasympathomimetic effect on the epithelial cells, miosis, and maintenance of the anterior chamber pressure so that it is not affected by diurnal variation in intraocular pressure (Er, 1997; Khachikian & Belin, 2009), were administered every 3 h during the daytime for the first 6 months. The refractive power of the eye changes during the first 6 months of the postoperative period, and the drops were reduced or stopped depending on the improvement in edema. If there was still evidence of edema, the drops were continued for another 6 months. Follow-up on patients was conducted by phone call to address patient concerns only. If during the patient follow-up telephone interviews there were reports of iatrogenic effects, patients would have been asked to see a local physician in their home country and have reports sent to me. No iatrogenic effects were reported. All patients in the study were from other countries in the Middle East region and returned within 11–13 months for a 1-year postoperative check-up, at which time data were collected. Patients declined to return for follow-up visits during the first year for economic reasons. Insurance in Jordan does not cover many operations in the field of ophthalmology. Patients were, however, informed that they would need to return for a 6-month and 12-month follow-up. 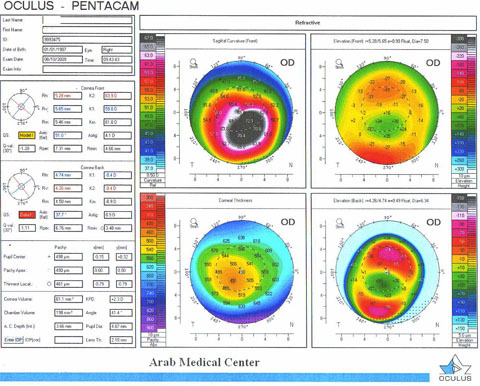 During postoperative examinations, patient data were collected using the E-test, refractometer, retinoscopy, direct and indirect ophthalmoscopy, sagittal cornea examination, subjective and objective visual acuity tests, ultrasound examination, glare test, and Oculus Pentacam topography and numerology. Astigmatism decreased in 87.5% of the 24 treated eyes, increased in 8.33%, and did not change in 4.17%. The percentage decrease in astigmatism ranged between 0% and 92% of the preoperative reading, with a mean decrease of 39% from the original astigmatic reading. 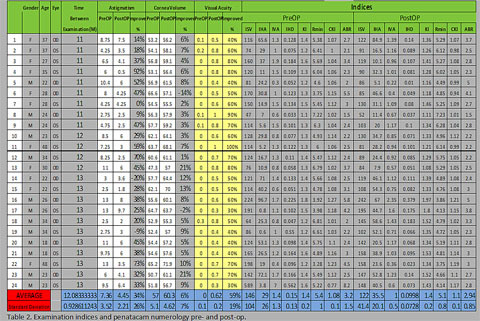 The percentage increase in astigmatism ranged from 9% to 20%, with a mean increase of 15% from the original astigmatic reading (Table 3). Corneal volume increased in 91.66% of treated eyes. The mean increase in corneal volume was 8% of the original corneal volume. Corneal volume decreased in 8.34% of treated eyes. The mean decrease was 8% of the original corneal volume (Table 3). Visual acuity improved in 100% of treated eyes. There was a mean improvement of 59% from the original visual acuity readings in all treated eyes. Two of the treated eyes (8.34%) improved to a visual acuity of 1.0 (20/20) with assistance (Table 3). The Bader procedure is based on the findings of the PERK Study Group (Waring et al., 1990), which states that the cornea is capable of regenerating cells for an indefinite period because of its ectodermal origin (Hoar, 1982; Naes, 2009); the natural healing process of the cornea should therefore be able to improve the keratoconic state by addressing any irregularity or steepness of the cornea and myopia. Immediately after this procedure the cone of the cornea relaxes and visual acuity improves. We have found that the greater the surface tension we can keep on the cornea during the procedure, the easier the procedure is to perform. During the healing process, the patient experiences fogginess of vision, which develops because of the laying down of keratocytes and edema of the cells (Tanaka, 2000). Absence of edema becomes obvious when the whitish coloration begins to disappear at the areas of incision, visual acuity improves, and the patient reports fewer shadows in vision. Funderburgh’s group postulated that multipotent cells are present in the corneal stroma (Du et al., 2005). According to Funderburgh et al. (2005), the cornea responds to acute wounds by activating nearby keratocytes, which assume a fibroblastic phenotype and secrete a non-transparent extracellular matrix, and since this regeneration occurs with no disruption of corneal function, it seems likely that the replacement cells arise from progenitor cells. The disappearance of the whitish color also may indicate that CTGF7 (a connective tissue growth factor) is present, creating the transparency necessary for vision. There also tends to be an increase in corneal diopteric power and the thickness of the cornea in different areas, which causes increased myopia. These changes have been noted in all incisional areas around the circumference of the cornea except the upper nasal portion. A habit that is formed during the progression of keratoconus is squinting to gain better vision. The squeezing that occurs during squinting can cause changes in the regular arrangement of the collagen stroma (Daxer & Fratzl, 1997). As a result of the procedure there is also an increase in astigmatic power until edema starts to subside. No suturing is used in our procedure because suturing is known to have a harmful iatrogenic effect (Leccisotti, 2006). 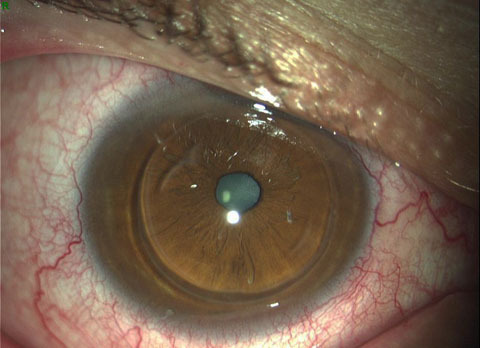 Ectasia is a known complication after corneal surgery (Duffrey et al., 2008), but has not been seen in any patient receiving this procedure, in which no foreign body is implanted in the cornea. During the healing process, the elliptical, irregular shape of the head of the cornea tends to become round and regain its regularity. Corneal diopteric power and the thickness of the cornea change as a result of this procedure. In this method of treatment, there is an increase in the thickness and width of the incision site and a change in the nomogram of the cornea and its indices, with its vertical and horizontal meridian releasing steepness tension, resulting in improved visual acuity. Visual acuity improves over time and the improvement depends on the speed at which the incision gap heals. It is important to note that, during preoperative and postoperative examinations, an inaccurate refractometer reading and an inaccurate astigmatic Pentacam reading are possible as a result of human error. Inaccurate postoperative readings may be obtained because of edema of the eye, which, in my opinion, scatters the light. The refractive error of each eye must therefore be corrected by the examining physician using the duochrome test and the fan test, starting with astigmatic correction and then sphere correction to eliminate human error. Objective and subjective tests are essential at this point to obtain accurate readings. As the cornea thickens, its diopteric power changes – the normal range of diopteric power in human eyes is from 43 to 45 diopters (Ganguli et al., 1975). This diopteric power facilitates proper interpretation of visual stimuli by the visual cortex. In the present study and our research on keratoconus, we found that there is low corneal diopteric power in some areas of the cornea and high diopteric power in other areas of the cornea, as observed by Pentacam topography. After corneal diopteric power begins to increase, the visual cortex is able to better interpret images received by the eye. It is our belief that the incisions, due to their unity, sharpness, and regularity, create the basis for the creation of a “tectonic plate” for the production of new stromal cells. Production of these cells continues for an indefinite period, and we have found that cell production is still occurring at the last follow-up but does not continue in all areas of incision. The body will stop the production of new cells once it reaches its genetic capacity, just like a wound or injury to the skin. We believe that, through circular and arcuate keratotomy, we are inducing cell growth in a ring-like pattern. Our findings can be more clearly seen by examining the case of one particular patient. This patient’s readings reflect an approximation of the mean changes that occurred in the present study. The predetermined surgical plan for this patient was to make paired arcuate keratotomy incisions 2.5 mm from the pupillary axis. The steepest axis was at 10°, the angular length of the arcuate incisions was calculated to be 100°, and the depth for the arcuate incisions was calculated to be 4.4 mm. A circular incision was made 7 mm from the pupillary center and the depth was 5.5 mm (90% of corneal thickness) from 210° to 330° and 4.9 mm in the remaining part (70% of corneal thickness). the rear of the cornea was 1.1 D preoperatively and 0.9 D postoperatively. The corneal volume preoperatively was 50.7 mm3 and after 1 year it was 61.1 mm3. These readings indicate that the cornea’s topography was changing. Figure 7 shows the patient’s eye on the day of the surgery immediately after the Bader procedure, and Figure 8 shows the same patient’s eye 13 months after surgery. Clinically, the thickness of the wound appeared to have increased in all areas, with edema and fogginess at the sites of the arcuate and circular incisions. Notice that there was a notch in the left arcuate incision at approximately 160° because of movement by the patient during the procedure. Also notice that the nasal portion was not as thick and some areas had less edema than others. The results of this study indicate that the Bader procedure is effective and promising in the treatment of Stage III and Stage IV keratoconus. It is necessary to understand that treatment with the Bader procedure involves a long-term relationship between the doctor and patient because the healing of the cornea occurs as a natural process of the body. There will be many in the scientific community who feel that incision in the cornea increases the potential for rupture. However, there has been no postoperative rupture in any patient who has undergone this procedure. Since arcuate keratotomy is performed after keratoplasty to reduce astigmatism, it makes sense, on the basis of our findings, to consider arcuate keratotomy coupled with modified circular keratotomy as an additional treatment procedure before performing keratoplasty as a final option for correction. Declaration of interest: The authors report no conflicts of interest. The authors alone are responsible for the content and writing of the paper. This study did not receive any funding from or contribution from the National Institutes of Health (NIH); Wellcome Trust; Howard Hughes Medical Institute (HHMI); and other(s). Colin, J., & Velou, S. (2003) Current surgical options for keratoconus. Journal of Cataract and Refractive Surgery, 29, 379–386. Daxer, A., & Fratzl, P. (1997). Collagen fibril orientation in the human corneal stroma and its implication in keratoconus. Investigative Ophthalmology & Visual Science, 38, 121–129. http://www.ncbi.nlm.nih.gov/pubmed/9008637. Dayanir, V., Sakarya, R., Ozcura, F., Kir, E., Aktunç, T., Ozkan, B. S., et al. (2204). Effect of corneal drying on central corneal thickness. Journal of Glaucoma, 13, 6–8. Du, Y., Funderburgh, M. L., Mann, M. M., SundarRaj, N., & Funderburgh J. L. (2005). Multipotent stem cells in human corneal stroma. Stem Cells, 23, 1266–1275. http://www.ncbi.nlm.nih.gov/pmc/articles/PMC1941788. [cited 2010 Jan 15]. Duffrey, R. J., Hardten, D. R., Lindstrom, R. L., Probst, L. E., Schanzlin, D. J., Tate, G. W., et al. (2008). 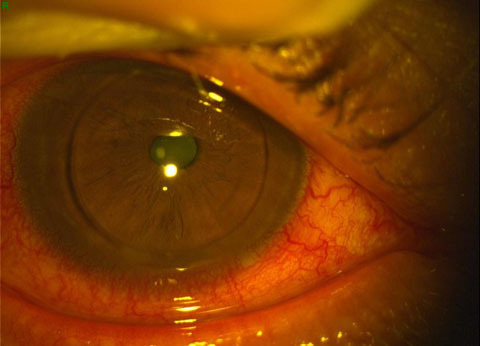 Ectasia after refractive surgery. Ophthalmology, 115, 1849–1850. http://www.ncbi.nlm.nih.gov/pubmed/18929166. Duffy, R. J., Tchah, H., Hofmann, R. F., Hofmann, R. F., & Lindstrom, R. L. (1988). Paired arcuate keratotomy. A surgical approach to mixed and myopic astigmatism. Archives of Ophthalmology, 106, 1130–1135. http://www.ncbi.nlm.nih.gov/pubmed/3401143. Er, H. (1997). The effect of topical parasympathomimetics on corneal epithelial healing in rabbits. Documenta Ophthalmologica, 93, 327–335. Funderburgh, M. L., Du, Y., Mann, M. M., SundarRaj, N., & Funderburgh, J. L. (2005). Pax6 expression identifies progenitor cells for corneal keratocytes. FASEB J, 19, 1371–1373. http://www.ncbi.nlm.nih.gov/pubmed/15901670. Ganguli, D., Roy, I. S., Biswas, S. K., & Sengupta, M. (1975). Study of corneal power and diameter in simple refractive error. Indian Journal of Ophthalmology. 23, 6–11. Hanna, K. D., Hayward, J. M., Hagen, K. B., Simon, G., Parel, J. M., & Waring, G. O., 3rd. (2003). Keratotomy for astigmatism using an arcuate keratome. Archives of Ophthalmology, 111, 998–1004. http://www.ncbi.nlm.nih.gov/pubmed/8328944. Hoar, R. (1982) Embryology of the eye. Environmental Health Perspectives, 44, 31–34. Hoffart, L., Touzeau, O., Borderie, V., & Laroche, L. (2007). Mechanized astigmatic arcuate keratotomy with the Hanna arcitome for astigmatism after keratoplasty. Journal of Cataract and Refractive Surgery 33, 862–868. Khachikian, S. S. & Belin, M. W. (2009). Clinical characteristics of keratoconus. In: Wang, M. (Ed.). Keratoconus and Keratoectasia: Prevention, Diagnosis, and Treatment. Thorofare, NJ: Slack. pp. 33–41. Krumeich, J. H., & Duncker, G. (2006). Intrastromal corneal ring in penetrating keratoplasty: Evidence-based update 4 years after implantation. Journal of Cataract and Refractive Surgery, 32, 993–998. http://www.ncbi.nlm.nih.gov/pubmed/16814058. [cited 2009 Apr 13]. Krumeich, J. H., & Kezirian, G. M. (2009). Circular keratotomy to reduce astigmatism and improve vision in stage I and II keratoconus. Journal of Cataract and Refractive Surgery, 25, 357–365. Krumeich, J. H., Daniel, J., & Knulle, A. (1988) Live-epikeratophakia for keratoconus. Journal of Cataract and Refractive Surgery, 24, 456-463. Leccisotti, A. (2006). Effect of circular keratotomy on keratoconus. Journal of Cataract and Refractive Surgery 32, 2139–2141. Naes, J. (2009). Embryology atlas. In Human Anatomy. Pearson Education. http://cwx.prenhall.com/bookbind/pubbooks/martini10/chapter18/custom3/deluxe-content.html. Ringsdorf Jr, W. M., & Cheraskin, E. (1982). Vitamin C and human wound healing. Oral Surgery, Oral Medicine, Oral Pathology, 53, 231–236. Tanaka, T. (2000). Comparison of stromal remodeling and keratocyte response after corneal incision and photorefractive keratectomy. Japanese Journal of Ophthalmology, 44, 579–590. http://www.ncbi.nlm.nih.gov/pubmed/11094170. Waring, G. O., Lynn, M. J., Fielding, B., Asbell, P. A., Balyeat, H. D., Cohen, E. A., et al., & Perk Study Group. (1990). Results of the prospective valuation of radial keratotomy (PERK) study 4 years after surgery for myopia. Journal of the American Medical Association, 263, 1083–1091. Wilkins, M. R., Mehta. J., & Larkin, F. (2005). Standardised arcuate keratotomy in post-keratoplasty patients. Journal of Cataract and Refractive Surgery, 31, 297–301. Wu, X., Yang, Y., Guo, H., & Chang, Y. 2006. The role of connective tissue growth factor, transforming growth factor β1 and Smad signaling pathway in cornea wound healing. Chinese Medical Journal, 119, 57–62. http://www.cmj.org/periodical/PaperList.asp?id=LW9047. Figure 1. Angular circumference of the cornea. Figure 2. One possible calculation and location for the paired arcuate incisions. Figure 3. Combination of arcuate keratotomy and modified form of circular keratotomy. Figure 5. Preoperative Oculus Pentacam topography. Table 1. Preoperative and postoperative sphere and cylinder readings. Table 2. Examination indices and Pentacam numerology. Date and place of birth: Ramaleh (1948) . Present status: Senior Ophthalmic Consultant. Address: P.O.Box: 926609 Amman – Jordan . Treatment of Keratoconus without Graft or Intacs (Bader Procedure First in the World 2005). New technique to correct Cornea, irregular Astigmatism. General Opthalmology and its Surgery. Iris Claw Implant Artisan Lens above the iris. Eye Tumors Diagnosis and Treatment. Treatment by R.K,Exc. Laser, Lasik, Intacs. Implantation of Contact Lenses for Pathological Myopia (1997). Implantation of Intracorneal Rings (INTACS), (1996). Keratoprosthesis (First Opreation in Jordan of its kind 1992). Implantation of Iris Claw lens (1992). Treatment of Myopia – Hypermetropia and Astigmatism (First operation in Jordan and Arab World of its kind 1983). Implantation on intraocular lenses in Jordan (First operation in Jordan of its kind 1982).